Read labels. Fresh turkeys are chilled between 26° and 40° F while frozen turkeys are below 0° . The latter are often injected with butter, magarine, salt, broth and/or flavor enhancers. Hen turkeys and Tom turkeys have the same meat ratio and tenderness. Plan ahead when purchasing a frozen turkey. For every five pounds, the turkey will take one day to safely defrost in the refridgerator. 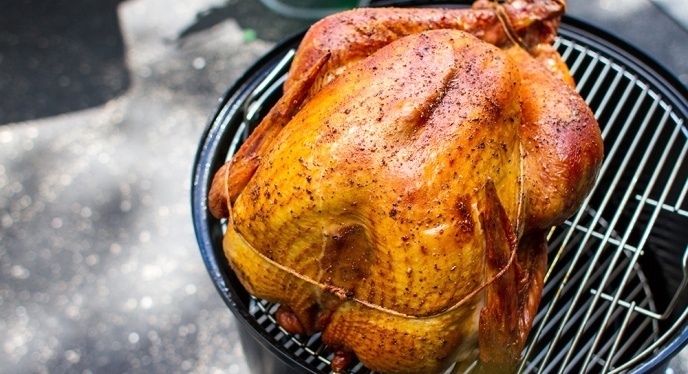 Place a drip pan under the bird in its original package so it won't leak (don't defrost at room temperature)! How much do you need? Rule of thumb is about a pound and a half per person - leftovers and seconds! And remember...turkey is the of the top 10 foods for your eyes with high levels of zinc and B-vitamins. Turkey consumption has doubled in the last 40 years. It is an ideal selection as a low-fat, high protein alternative to higher-fat meats. Turkey is also highly versatile in soups, sandwiches, grilling recipes, platters and so forth, making it an ideal choice for backyard grilling. - Modified from the Weber Grill blog. Food tastes better off a grill...visit us to grab your holiday cooking accessories. Or if you're planning for backyard grilling in 2017, visit Weber and Big Green Egg!